Öndverðarnes, the extreme tip of the Snæfellsnes peninsula. 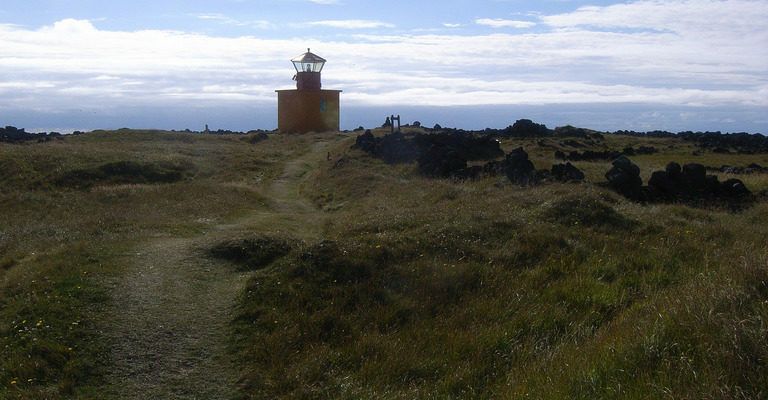 The area between Öndverðarnes and Rif is a great place for bird watching. Formerly a substantial farm with a chapel, now a lighthouse. Deep in the ground is the old well, Fálki, with 18 steps leading down to it. South of Öndverðarnes are cliffs known as Svörtu­loft (“Black skies”), where ships have been wrecked. Nearby is the big Neshraun lava field, with many old craters such as Öndverðarneshólar, Saxhóll etc.